Hi everyone! Today is the final day of Pawlympics competition. 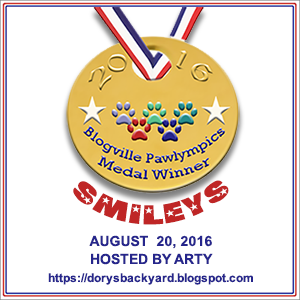 The Smileys event is being hosted by Arty at Dory’s Backyard. What a great event to finish the Pawlympic events. Millie started off the competition with her “After Play Smiley”. 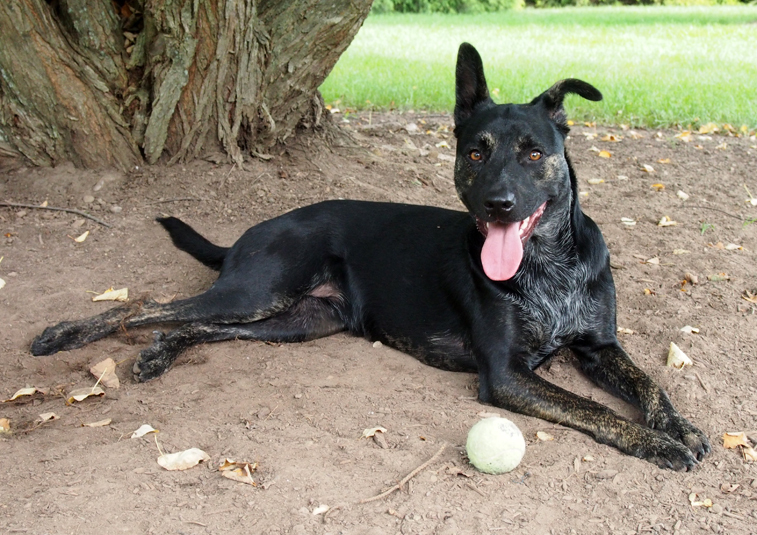 I love keeping the tennis ball away from Walter. Next up Walter is flashing his “Handsome Boy Smiley”. I hope Tuiren likes my smile. We are both have a lot to smile about. We’re lucky to have retired pawrents that take great care of us and hardly ever leave us alone. Maybe someday we will show you our “We’re so happy you’re home” smileys but our mom said something about needing a GoPro camera to manage that. Well that concludes the competitions in the Blogville Pawlympics. Please be sure to stop by Dory’s Backyard to see all the competitors in today’s event. Tomorrow is the closing ceremonies that will be hosted over a few blogs. 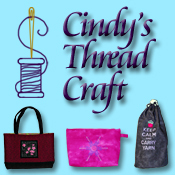 You can start at Dory’s blog to find all the festivities. We sure had a great time competing and wish to thank all the hosts for all their hard work. Hi everyone! We are back for another couple of events for today’s Blogville Pawlympics. 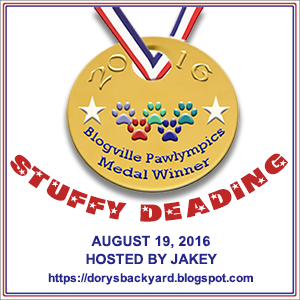 First up Walter is competing in Stuffy Deading hosted by Jakey from Dory’s Backyard. 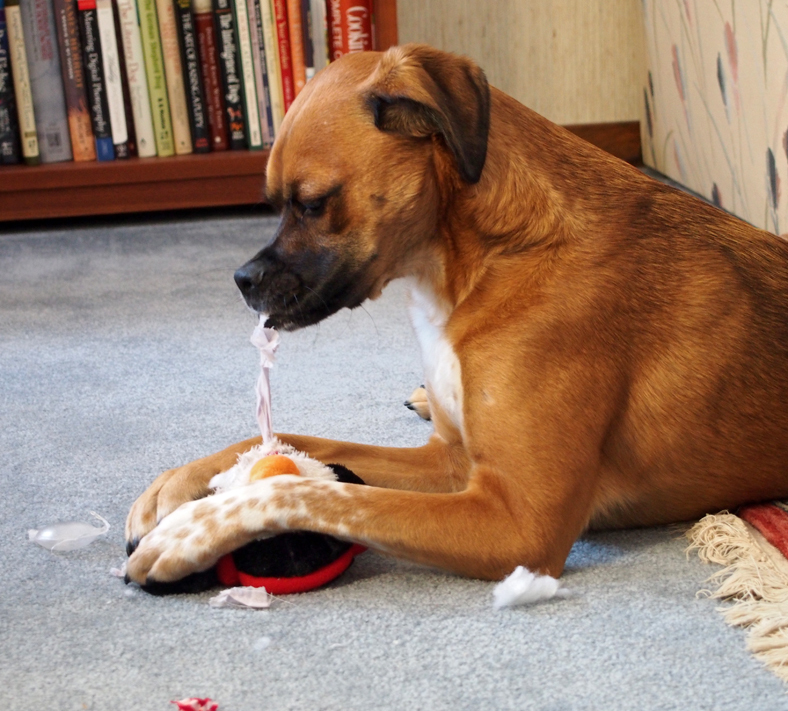 We sure have seen in the past that Walter is excellent at tearing the guts out of any stuffy. Oh look I found the intestines! There were a lot of competitors but Walter put in a gold medal winning performance. 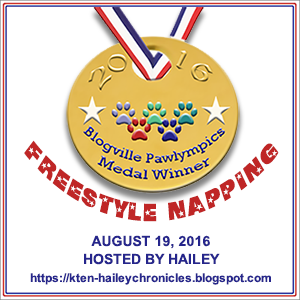 Next up we are competing as a team in the Freestyle Napping event hosted by Hailey in honor of her human dad’s birthday. She explains that napping with her dad is her favorite thing to do. 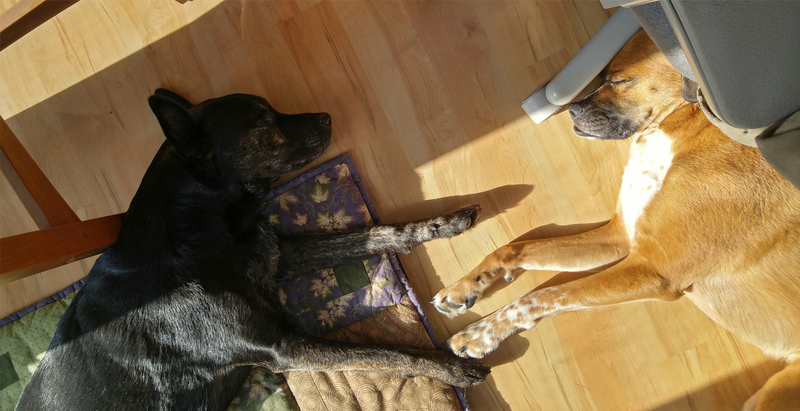 We have to agree but we chose just a tandem entry of the two of us squeezing in next to mom’s computer chair with some added sun puddle action too. As always we turned in a gold medal performance. Please be sure to stop by the hosts for today’s events and thank them for hosting. We sure had a lot of fun competing. There is only one event left before the big Closing Ceremonies so be sure to come back tomorrow. Hi everyone! We are back for another couple of events for today’s Blogville Pawlympics. 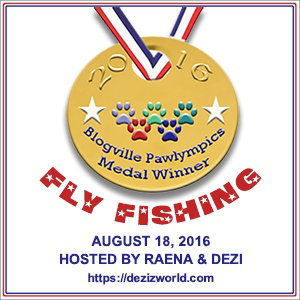 First up is the Fly Fishing event hosted by ReanaBella and Dezi at Dezi’s World. This one is mostly for the kitties but we knew we could participate too. Our dad has us on the end of his line and is reeling us in. Our dad loves to go fishing and he caught a couple of live ones here. Another gold medal performance for sure. 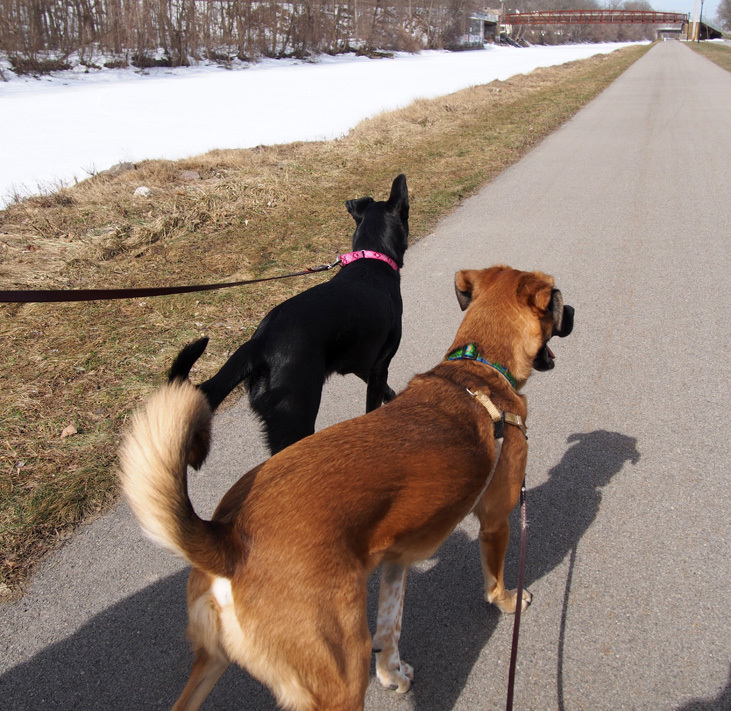 Next up Addie is hosting Synchronized Walking and Looking. 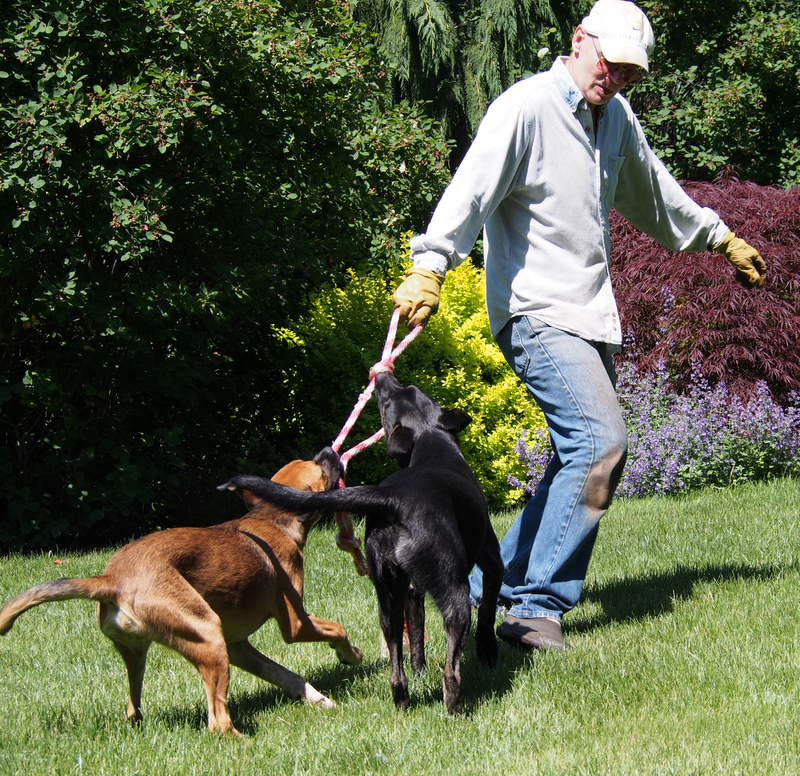 This one is kind of tough for us because Walter never walks in a straight line when we are on a walk. This is the closest we could come. Please be sure to stop by the hosts for today’s events and thank them for hosting. We sure had a lot of fun competing. Come back tomorrow to see what we are competing in next. Hi everyone! 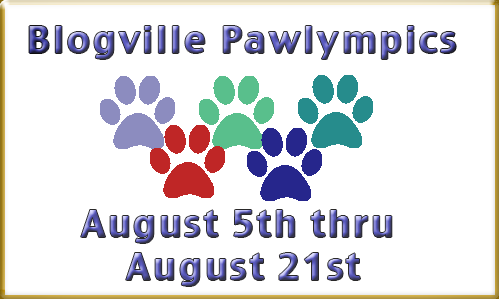 Today there is just one event at the Pawlympics. 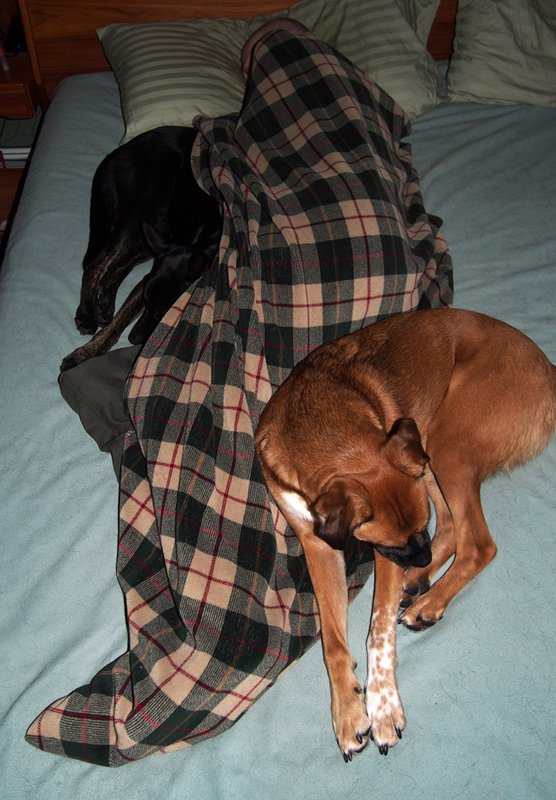 The Snuggling event is being hosted by Marg’s Animals. We decided to enter this event as a pair but actually it is a trio entry. We love nothing better than snuggling with our dad. We fit into all his curves and turned in a gold medal winning performance. Please be sure to stop by the host for today’s event and thank them for hosting. I sure had a lot of fun competing today. Come back tomorrow to see what we are competing in next. Hi everyone! We are back for another couple of events for today’s Blogville Pawlympics. First up is an event that we both are participating in and we think will need a bit of explaining. After reading today’s blog title you might be wondering what “Munro Bagging” means. Our Scottish friend Bertie is hosting this event and he describes Munro Bagging as, “a ‘Munro’ is a Scottish mountain over 3000 ft high, and if one reaches the summit one is said to have ‘Bagged a Munro’. He had us choose a Munro to bag from an online guide to all of Scotland’s Munros. We found two with the same name, Stob Ban (which means White Peak), in different locations and went for those. 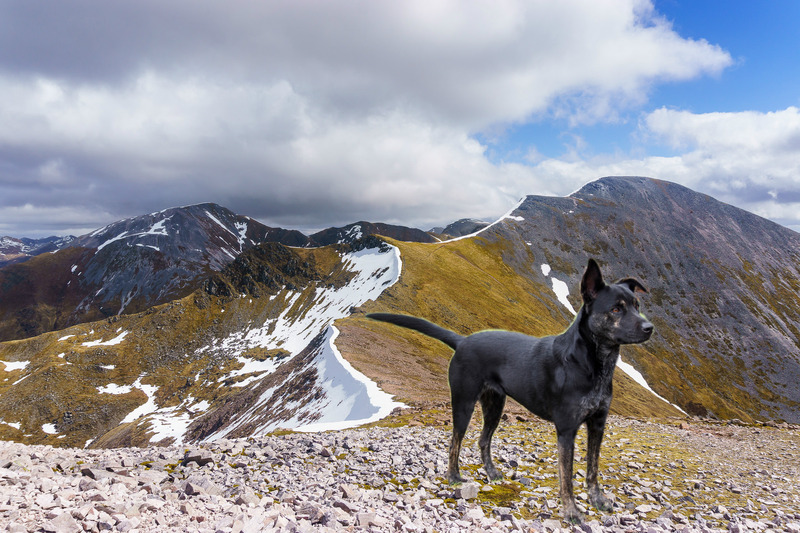 Here are the pictures Bertie took of us on our chosen Munros. Here I am on Stob Ban (Mamores). You can read more about this Munro here. Its a good thing the weather is was clear enough for me to see where we started from. As you can see there is a bit of snow up here still. It is a nice relief to be in such a cool place since back home we are having one of the hottest summers on record. 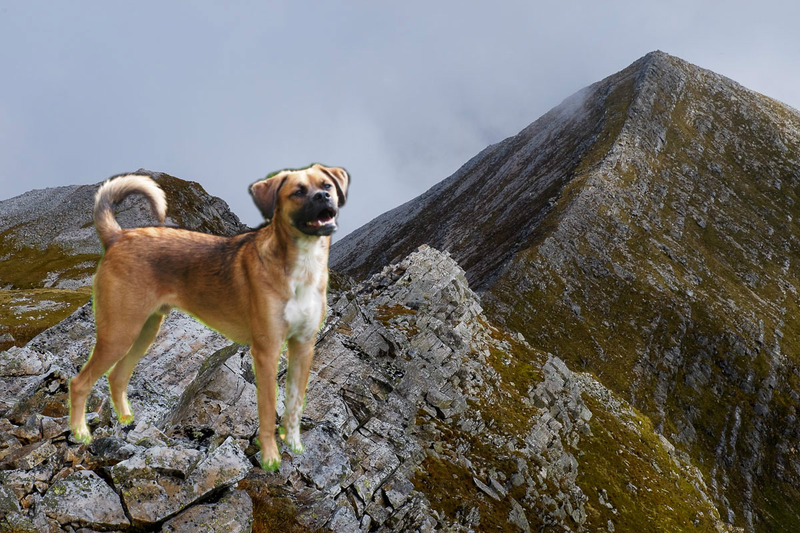 Here I am on Stob Ban (Grey Corries). You can read more about this Munro here. What a great hike it was to the top of my Munro. Bertie tells a harrowing tale of when his human Gail and her Westie Hamish once had a very scary time camping on this ridge in a blizzard. I’m glad there isn’t a blizzard today but it sure is nice to be somewhere cooler than home. We sure had fun hiking in Scotland today and Bertie says we both get gold medals. Next up Oreo is hosting the Bubble/Ball Jumping event. 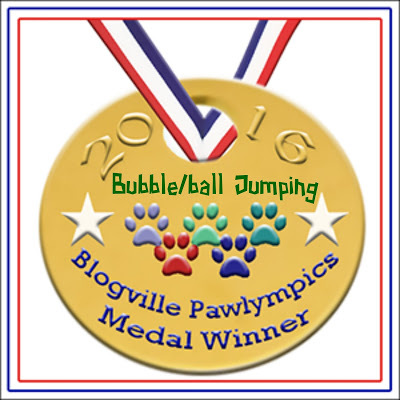 Originally Oreo wanted his event to be just bubble jumping but he realized that “not all dogs like bubbles so this event involves bubbles and balls.” We all know that Walter is the high flyer among us so Millie is taking a pass at this event. Thanks for helping me get big air dad! 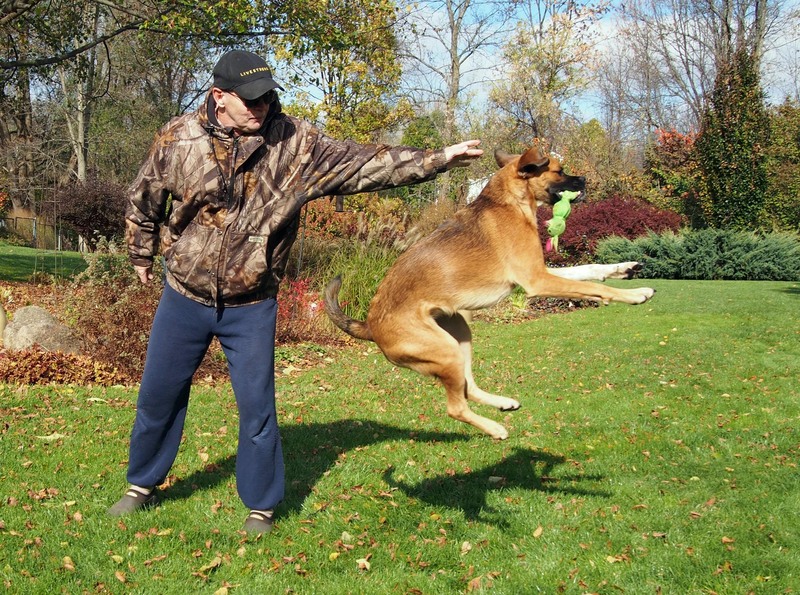 Anybody that knows Walter knows that he loves to jump. As always he turned in a gold medal performance. Hi everyone! We are back for another couple of events for today’s Blogville Pawlympics. 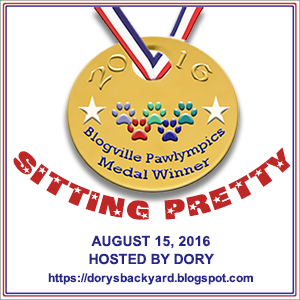 First up is the Sitting Pretty event hosted by Dory. Walter loves to sit and pose but to get a sitting picture of Millie you really have to sneak up on her when she isn’t looking. She would rather be laying down than sitting any day. I’m always happy to sit for a picture especially if there are treats involved. I like to make sure there are no squirrels in the yard. 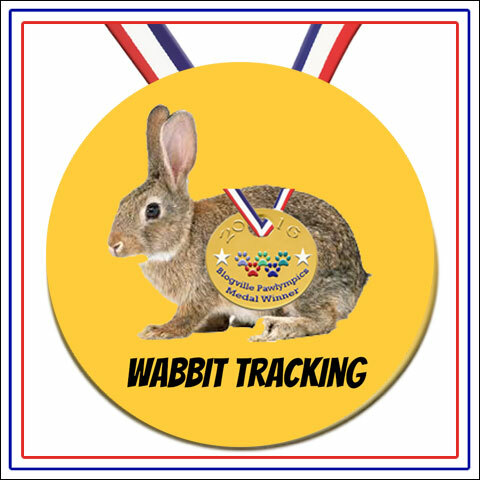 We did such a great job that we both won a gold medal. Next up Emma and Bailie at My GBGV Life are hosting the Wabbit Tracking event. 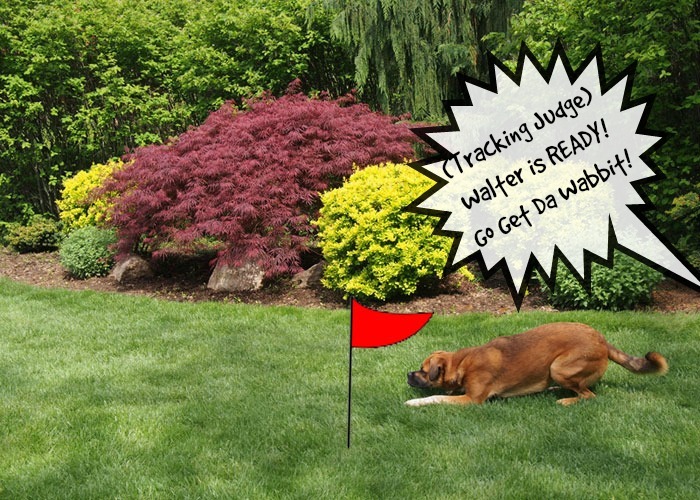 Even though we occasionally have wabbits in our yard Millie prefers to track the chipmunks so Walter is our only entry in this competition. I almost got a false start waiting so long before the judge said Go! As always Walter turned in a gold medal performance. Hi everyone! It’s Millie here. I’m back competing in the Gymnastic Bathing event in the Blogville Pawlypics. This event is being hosted by Toby’s Wrecking Crew. 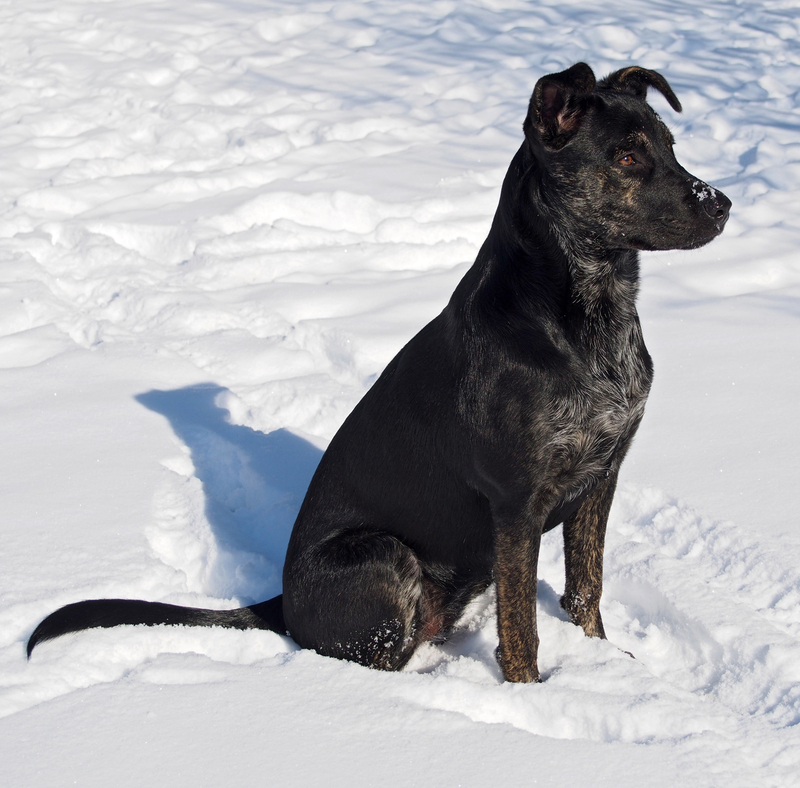 We all know how cats bath themselves a lot but us dogs aren’t nearly as fussy as they are. To be honest there really are only two body parts that we dogs lick regularly but our mom won’t take any pictures of us doing that. There is something (or is it someone?) that I lick every day that our mom was willing to get a picture of so here is my entry in this difficult event. 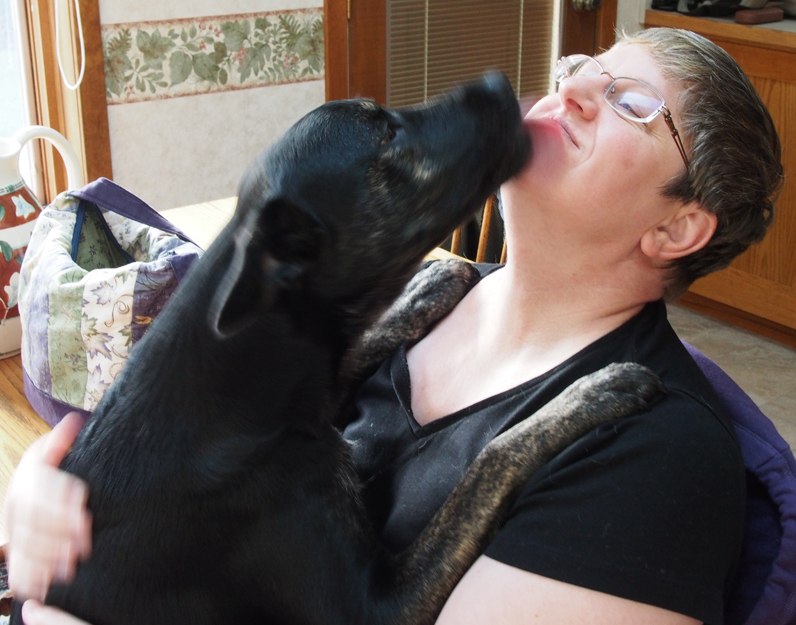 Without fail, every morning when my mom sits down to put her shoes on to take us outside to do our business I like to put my paws on her shoulders and make sure her chin is clean. I’ve heard she drools a lot in her sleep and I wouldn’t want her to go outside looking like a mess. BOL! As usual this was a gold medal winning performance. Please be sure to stop by the hosts for today’s events and thank them for hosting. I sure had a lot of fun competing today. Come back tomorrow to see what we are competing in next.